The ZarYevka Ballet has been creating colorful, magical story ballets for the whole family since 2011, opening their first work “Peter and the Wolf” to sold-out houses in Victoria, BC. Since then, they have shared the excitement of live dance with over 50, 000 young people and been presented by schools, arts councils, heritage sites, arts festivals, and more. A unique combination of puppetry, story-telling, and athletic dancing has generated rave reviews consistently. This energetic small company regularly visits remote communities, making dance unusually accessible for presenters with limited budgets. Committed to making ballet fun and engaging, the Company offers witty narration, great music and laughter as the hallmarks of ZarYevka Ballet’s charming storybook style. 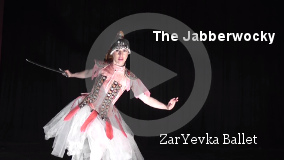 ZarYevka Ballet visits schools via ArtStarts In Schools with 45 minute presentations created especially for K-7 students, available with narration in either English or French. Relevant issues are at the center of the story-telling; our current show “The Jabberwocky” addresses gossip, and our newest offering “The Fish & The Bird: A Fantastic Fable” addresses racism. We believe visual engagement is key in communicating with young audiences, and so every presentation features beautiful scenery and costumes, giant puppets, surprise effects and great music. Please contact rekha@artstarts.com to share a presentation with your Young Audience!